House insurance is one of those necessary evils - something that most of us don't want to pay for but do begrudgingly, just in case the worst actually happens. After all your home is likely to be the most valuable asset that you invest into - and it's not only the monetary value that matters, if something happens to your home or your possessions it can shake your stability and your happiness, not to mention your state of mind. It's a sad fact that 1 in 3 households in the UK will be burgled at some point and yet it's estimated that around 25% of households are not protected by any kind of home insurance. It's not just thieves you need to protect yourself from either - Every year thousands of homes suffer from a fire of some sort and the extreme weather conditions the UK has experienced over the last few years - such as flash floods and storms - have cost some UK homeowners thousands and thousands of pounds, with some even losing their homes entirely. Unfortunately there is nothing you can do to protect yourself from the painful loss of sentimental items, but by carefully choosing your home insurance, you can at least make sure that you can protect yourself financially - and not end up out of pocket. 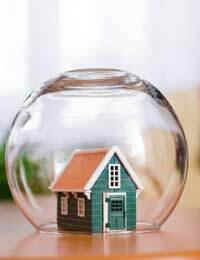 If you are a homeowner, it's likely that you'll already have come across home insurance in the form of building insurance - as most mortgage lenders now insist upon you taking out at least this level of protection on the property before they'll agree to grant you a mortgage deal. Building Insurance is what it sounds like - protection for the actual 'bricks and mortar' of your property, rather than your personal items. So if the house was to burn to the ground, then you'll be covered and you won't be expected to fund the rebuilding of your property whilst still paying the mortgage. To provide you with a building insurance or 'bricks and mortar' quote, the insurer will need to take some information from you - such as when the property was built, what it was built with and various period features, such as original Victorian fireplaces, or hardwood floors. They will also want to know about any issues such as flooding that has occurred over recent years. Make sure that the policy doesn't only cover the market value of the property - especially if this is a time when house prices have dropped. It's also worth checking whether or not you will be provided with alternative accommodation should something happen to your house that renders it inhabitable. Check the boundaries of your policy - does it include your garage, garden shed and your boundary walls and fences? Home Contents insurance covers anything that is not structurally fixed into your home - e.g. white goods, clothes, furniture, TV, etc. In many cases it even covers the contents of your cupboards and your fridge freezer! First of all, the cheapest contents insurance is indemnity insurance, which replaces things on a like for like basis - if, for example, you have an older TV or Sofa that gets damaged, then the insurance company will replace it with one of a similar age. New for old is more expensive, but will replace your older TV or sofa with a new one, regardless of its age. You can choose to be covered for items 'away from the home'. These can include things like expensive camera equipment, or a laptop, music player or a bicycle. You may need to pay extra for this, or perhaps for individual named items over a certain amount of money. Your policy may cover you if you are injured in your home or if someone else is injured in your home because of your negligence. Don't underinsure your contents. Underinsuring may keep your premium costs down but if you need to claim then you won't be able to replace everything that you have lost. Check everything that you own and tot it up to get a realistic sum. Keep receipts and credit card statements. In the event that you need to claim against your contents insurance, you might find that the insurers want proof of purchase. Remember to check if there is a limit to the amount paid out for individual items and either increase the individual limit amount or if you only have one or two such items, consider keeping your premium lower and insuring them separately. Find out if you are covered for accidental damage, and if so, what you are covered for. Make sure you are covered against the basic requirements - fire, theft and vandalism. Don't forget to update any policy if you add to your property, splash out on new furniture or buy expensive household items or clothing. There are lots of good deals out there, including those which give you a ‘reward’ for signing with them. Remember that insurance companies can afford to be competitive, and shop around until you find the best deal.